The current level of investment in Scotch whisky hasn’t been seen for over a century. Now, with 10 new distilleries set to open in 2018, this decade is on track to witness the largest number of openings in history. Becky Paskin reports. When it comes to staying on top of new distillery openings, it’s fair to say that 2017 kept us on our toes. In fact, at times it seemed that a week didn’t pass without a new distillery project being submitted to planners. It hasn’t been all new builds either – as interest in Scotch single malt soars, distillers have announced the reopening of mothballed sites to meet demand. In October Ian Macleod Distillers announced its intention to reopen Rosebank distillery in 2019, less than 24 hours after Diageo revealed plans to reinstate the cult distilleries of Port Ellen and Brora by 2020. As exports of single malt reached a new annual high of £1 billion – now accounting for 25% of the total value of Scotch exports – investment in Scotch whisky is now at a level not seen since the 1890s. During that decade, about 40 new distilleries were opened. Now, more than 100 years later, the 2010s are likely to exceed that record. In 2017 alone we saw the opening of 10 new whisky distilleries of varying sizes, from a traditional set-up in a castle shed in Dornoch, through to the subterranean Goliath that is Macallan V2.0. Sometimes a new distillery will sneak in under our radar, and as such four new operations sprung to life during the year that were not included in last year’s list of anticipated openings. August saw the launch of Twin River distillery, a modest operation situated at Deeside Brewery that became the area’s first whisky distillery to open for 200 years. ‘Barley to bottle’ distillery Aberargie announced its arrival in mid-November, while just days later the crowdfunded, eco-friendly GlenWyvis began distilling on St Andrew’s Day (30 November). Meanwhile, BrewDog’s distilling operation Lone Wolf, which had been active since 2016 making gin and vodka, revealed it had quietly begun producing some of the first rye spirit seen in Scotland for over a century. This year is expected to be just as busy, with an additional 10 new whisky distilleries anticipated, including two delayed projects rolled over from 2017, the first grain distillery to be built in Scotland since 2010, Edinburgh’s first new site for over a century and Islay’s ninth distillery. Don’t pause for breath just yet – the spate of new Scotch distillery openings isn’t expected to halt at the end of the year. With an additional 22 projects at various stages of planning, there’s plenty still to come in 2019 and beyond. For now, here are the 10 new distilleries set to open in 2018. Visitors to the 2018 Islay Festival (25 May – 2 June) will be spoilt for choice this year as the island welcomes its ninth whisky distillery. Independent bottler Hunter Laing expects to have Ardnahoe distillery ready in time for the festival, although its open day is yet to be confirmed. Situated on the island’s northeast coast, Ardnahoe resides in an area of outstanding natural beauty. With its glass walls visitors can appreciate panoramic views of Jura and the Sound of Islay from within the stillhouse, while nature trails will be laid out to allow visitors to take in the surrounding area. Designed to be manually operated, Ardnahoe will feature long lyne arms – claimed to be the longest in the world – as well as Islay’s only worm tubs, and is set up to make several different styles of whisky, from non-peated (a style production director Jim McEwan calls the ‘Ardnahoe Whisper’), through to heavily peated spirit. Find out more about Ardnahoe distillery. Construction work on a new £15m distillery at Ardross Mains Farm in the Averon Valley, some 30 miles north of Inverness, began in November 2017. As part of the build, dilapidated buildings of a 19th-century farm steading are being sympathetically renovated to incorporate a whisky and gin distillery, which are expected to be operational by late 2018. Find out more about Ardross distillery. Originally slated to open in July 2017, the first Borders distillery for more than 180 years is running about six months behind schedule, and will now start producing whisky in January 2018. Situated in Hawick, the £10m distillery will be capable of producing up to 1.8m litres of spirit each year, for both single malt whisky and gin. The distillery will occupy a disused 19th-century engineering plant, which was originally the headquarters for Hawick Electricity Company, and will draw its water from the adjacent River Teviot. Not all new distillery projects are announced with a colourful press release and promotional video. Some, such as Burnbrae in East Kilbride, prefer to forgo the fanfare and simply get on with production. Over the past few years, blender and bottler J&G Distillers, which produces blended Scotch brands such as Barclays, McIvor and Bonnie & Clyde, and owns independent bottler Hart Brothers, has been quietly renovating and extending its bonded and bottling warehouses in East Kilbride. The renovations have included the transformation of part of the site’s main building into a malt whisky distillery, which is expected to become operational in early 2018. While those passing by the site may catch a glimpse of the stills through the building’s glazed floor-to-ceiling windows, the distillery is not expected to open to visitors. Back in April 2017 Graham Taylor established what he deemed a truly ‘craft’ Scottish distillery in Newton Stewart, Dumfries & Galloway. Its first release was Hills & Harbour gin, billed as a fun, affordable product for all, not just ‘Victorian gents or Soho hipsters’, made using neutral grain spirit from the Netherlands blended with Crafty distillery’s own wheat spirit. The long-term plan, however, was never to just stop at gin. In 2018 Crafty will begin production of its first single malt whisky, a fruity spirit fermented for long periods that’s matured predominantly in virgin American oak casks. As its name suggests, we can expect plenty of experimentation from this small distillery. Glasgow’s distilling renaissance will receive a further boost later this year when Douglas Laing & Co.’s £10.7m distillery opens at Pacific Quay. The independent bottler revealed plans for the distillery and new company headquarters in July 2017, announcing its intentions to ‘own the production process from start to finish – barley to the bottle’. The distillery – the name of which is yet to be publicised – will become the city’s fourth whisky distillery, joining the Strathclyde grain plant, Glasgow and Clydeside malt distilleries. Find out more about Douglas Laing & Co.’s distillery. The first of three single malt whisky distilleries planned for Edinburgh will arrive this summer, at the Forth Industrial Estate in Granton Harbour. The blink-and-you’ll-miss-it distillery, planned by Liverpool drinks producer Halewood Wines & Spirits, will produce only 165,000 litres of spirit each year, but the opening of this humble operation will bring the John Crabbie & Co. name back to the Scottish capital. Now owned by Halewood, John Crabbie & Co was one of the six founding partners of Edinburgh’s North British distillery in 1885, with John Crabbie the conglomerate’s first chairman. While the name is today more readily associated with alcoholic ginger beer, John Crabbie & Co was initially concerned with distilling, blending and bottling Scotch whisky. This summer, the Granton Harbour development will finally see the company return to its roots. Find out more about Crabbie’s distillery. 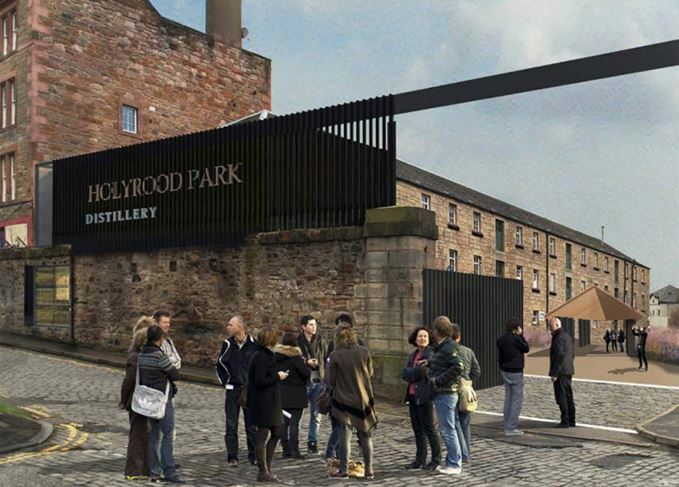 Plans to transform Edinburgh’s Engine Shed into a malt whisky distillery and visitor centre have been in full flow since 2015, and finally, by the end of this year, the new Holyrood Park distillery is expected to open. First and foremost a visitor attraction, Holyrood Park will produce about 100,000 litres of spirit each year, making it among the smallest distilleries in Scotland. Gin, vodka and liqueurs will also be produced on site in a second still. Once up and running, the distillery will offer visitors an immersive educational experience, from sampling products in the tasting room to learning about wood in the maturation area. Find out more about Holyrood Park distillery. While Scotland has welcomed plenty of new single malt distilleries in the past decade, only two grain distilleries have been built in the last 55 years – Loch Lomond in 1993, and Starlaw in 2010. This year, Scotland’s eighth grain distillery and second multi-purpose distillery is set to open in the Scottish borders. Reivers is the first of two malt and grain distillery complexes being built by Mossburn Distillers, the owner and operator of Torabhaig on Skye. Situated near the banks of the River Jedwater, Reivers (formerly known under the project name Jedhart), is a small, experimental distillery designed to produce a range of spirits, including malt whisky in pot stills and grain whisky in columns. The site, which takes its name from the savage raiders that disrupted the Borders in the 13th century, is expected to be operational by June. Meanwhile, its sister distillery, the larger Mossburn complex, won’t come online until at least 2020. Find out more about Reivers distillery. Initially expected to be operational in May 2017, Toulvaddie distillery is thought to be nearing completion. The site at Fearn Aerodrome near Tain will be the first whisky distillery to be founded solely by a woman – television producer Heather Nelson – and will produce a humble 30,000 litres of a ‘light, easy-drinking’ whisky once up and running. In preparation for its opening, Toulvaddie is entering all Friends of the Distillery into a prize draw to win the first bottle of single malt whisky produced by the distillery. If those haven’t got you excited, the next couple of years are expected to be just as busy for new distilleries, with the opening of Lagg, Arran’s second distillery; Scotland’s first vertical distillery in Leith; an educational set-up at Cabrach; a malt distillery at Dunrobin Castle; a £12m site at Ardgowan in the Lowlands; Mossburn’s second multi-purpose malt and grain plant; the renovation of a ‘ghost’ village; plus, will we finally see Gartbreck up and running on Islay?